Big sales targets can mean sacrificing your core ideals, and Maserati now offer not just one, but two new diesel-powered saloons. We've previously tried the flagship V8 Quattroporte GTS, but for any buyers who find that car’s incredible thirst for fuel and high list price hard to swallow, this new diesel version could be the perfect fit. Prices start at £69,230, making the V6 diesel by far the most affordable model in the three-strong range, and with a claimed economy figure of 45.6mpg, it’s almost twice as frugal as the turbocharged V8. 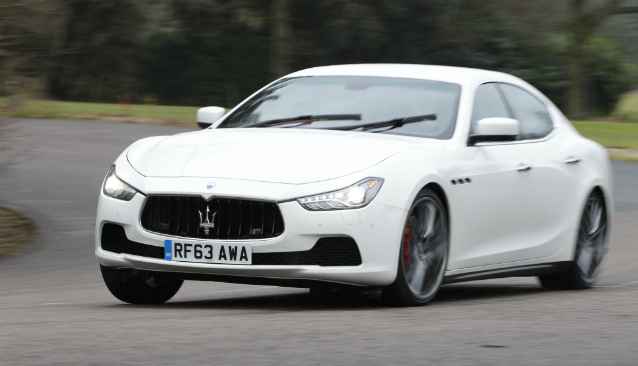 Small wonder then that Maserati expects the diesel to make up nearly two-thirds of UK sales. But can it really tempt wealthy execs away from traditional German limos like the BMW 7 Series and new Mercedes S-Class? Well, although the 3.0-litre V6 diesel has less power than its petrol siblings, there is 600Nm of torque - available from 1,900rpm onwards – which gives it serious mid-range muscle. So while 0-62mph in 6.4 seconds might not sound that impressive, on real roads it rarely feels lacking in urgency or overtaking clout, despite its huge size. The engine is the same VM Motori unit fitted to the Ghibli diesel, and like the smaller car, the Quattroporte comes fitted with ‘Active Sound’ generators in the exhaust tips. They work by filtering out the best noises from the engine, and then amplifying them back into the cabin. However, while it masks some of the coarse diesel rumble, the V6 never comes close to matching the GTS for aural excitement. Still, overall refinement is good (if not quite as serene as the S350 CDI) and the diesel Quattroporte does a fine job of isolating its passengers from unwanted road and wind noise. The eight-speed ZF auto gearbox is not quite as smooth or precise as it is in the GTS though, with a noticeable gap between each pull on the paddle and every change. The driving experience is still on the sporty side, with decently weighted steering that is fast and fairly precise, minimal body roll and a firm ride – passengers in the back will quickly complain if you’re travelling down a bumpy or uneven road at speed. They won’t be lacking in legroom though, as customers have the option of either two individually adjustable rear seats or a three-seat bench but no one sitting in the back will be lacking in legroom, and there is far more space than you got in the old car. The interior is a dramatic departure from its predecessor too, with a large touchscreen display removing the need for cluttered buttons on the dash and a smart design. Still, it does feel a little flimsy in places though, and some of the material quality is not as high as you’d get in the (cheaper) German opposition. Even so, there are no hints on the outside to alert other motorists that you’re in the diesel, and for a few buyers we suspect that the distinctive design and brand exclusivity will be more than enough.